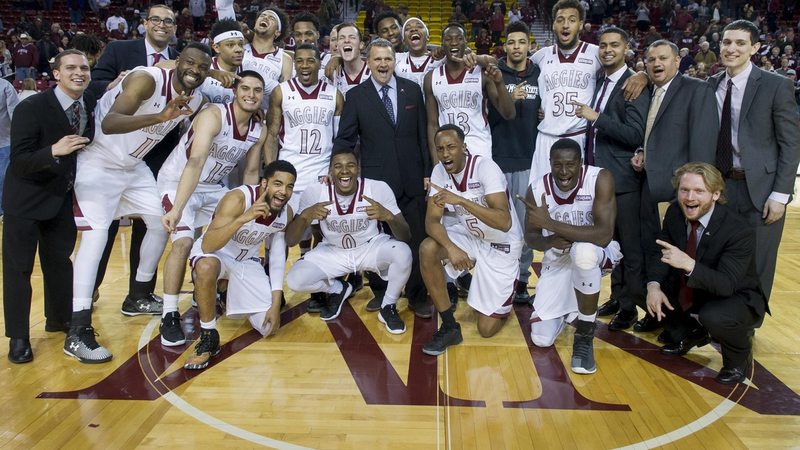 Aggie fans have reason to be excited about the men’s basketball team, especially with the WAC tournament starting today in Las Vegas, Nevada. The Aggies have a stellar team with a stellar defense, making them a major contender to win the title once again. This year’s team is one of the best teams the university has had. The Aggie defense is top-notch. NMSU is ranked eighth in the nation for fewest opposing points allowed per game, allowing an average of 63 points. Coach Chris Jans, new to NMSU, is the reason for this. His system is built around the team’s defense. Even though the Aggies do not have a high offensive scoring rate, the defense makes up for it. When it comes to individuals, there are a couple of notable standouts. Jemerrio Jones is making national noise. He is second in the nation for rebounds per game. He is a hustle player who has been a great part of the Aggies’ success this season. Another notable individual is Zach Lofton. He is the team’s leading scorer by far, averaging 19.3 points per game. His offensive game is relentless. He can score from anywhere on the court. Lofton was even featured in SportCenter’s “Top 10 Plays” for dribbling behind his back, causing an opponent to lose his balance and fall down. However, it is not just individual players that have made this year’s team so great — it is the team’s energy and chemistry on the court. NMSU undergraduate Preston Schollander is a dedicated Aggie fan. “It feels like this team has the same energy as last year’s team, but they are playing for more of a purpose. With [former head coach] Paul Weir leaving, it felt like it made the team and city rally around themselves,” Schollander said. This sense of purpose has led the team to a current 25-5 record. The Aggies head to Las Vegas as the No. 1 seed and first in conference play with a record of 12-2. The two losses were back-to-back against Utah Valley and Seattle University. NMSU alumnus Carlos Aguilar has been following the team’s success this season. “The big thing now is they have to shake off these two losses and get back to playing better ball. The only way they lose in the WAC tournament is if they play poorly,” Aguilar said. These losses let the Aggies know they are not invincible and will have to take every opponent seriously. Aggie fans have high hopes and expectations for the WAC tournament. Stakes are even higher if the team is able to win the title and advance to the NCAA tournament. NMSU graduate student Isaiah Ramos seems optimistic about NMSU’s post-season chances. “If they’re able to win the WAC, I really feel that this is the year they can make some noise in the NCAA tournament. It’s time to end another drought,” Ramos said. If the Aggies do make it to the Big Dance, it’ll be tough for them to receive a high seed in the tournament due to their two losses. The Aggies, however, have already let it be known they can play with anyone in the country. Earlier this season, they beat Illinois and No. 7 Miami, and lost a close game to USC in the championship game of the Hawaiian Airlines Diamond Head Classic. Only time will tell how far the Aggies will go, but this year may be their year. The WAC tournament kicks off for the Aggies tonight at 7 p.m. as they take on No. 8-seed Chicago State.